Bonnie Anna "MissChief" from FunDipped Productions does some random tumbling and gets the best surprise fan. FunDipped Productions is an Orlando based circus theatre company devoted to simultaneously educating and entertaining all ages. 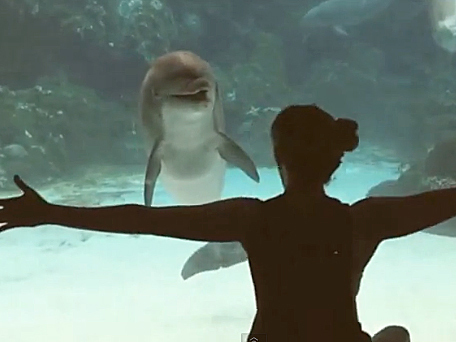 The look of sheer joy on the dolphin's face by this impromptu performance mirrors my own while watching. A big triple-rainbow salute of wonder and awe goes out to Bonnie and FunDippedProductions from us at The Feed for providing this smile-inducing moment! And to check out more from FunDippedProductions, you can visit their YouTube page by clicking here.